This Portugal and Spain tour takes you on a breathtaking journey through these two Iberian countries that, while neighbors, offer two completely distinct and unique cultures. Starting and finishing in Lisbon, this 16-day Portuguese Tour vacation offers you the highlights of both Portugal and Spain. Two-night stays in Lisbon, Santiago de Compostela, Madrid, Seville and the Algarve ensure that you'll get the most out of these amazing destinations. In-depth city sightseeing includes the most important sights, like Lisbon's Belem Tower and Jeronimos Monastery, Santiago de Compostela's Cathedral Vieja, Madrid's Prado Museum, Toledo's Church of Santo Tomé with one of El Greco's most famous paintings, Granada's Alhambra, and Seville's tomb of Columbus. The two nights in Algarve let you join the included excursion to Henry the Navigator's Promontory of Sagres and Cape St. Vincent or make your own discoveries. Of course we include a Port wine tasting and Don Quixote's La Mancha landscapes. Day 1, Board your overnight transatlantic flight. Day 2, ARRIVAL IN LISBON, PORTUGAL Time to rest or start exploring. At 6 p.m. meet your traveling companions at a welcome drink hosted by your tour director. Day 3, LISBON . Now the capital of a small country on the western fringe of the Iberian Peninsula, Lisbon was once the center of Europe's longest-lived overseas empire. Morning sightseeing includes two Manueline jewels: Belem Tower and Jeronimos Monastery with the tomb of Vasco da Gama. Drive past the Bull Ring to Pombal Statue and along the grand Avenida da Liberdade. Enjoy a walk through the cobbled alleys of Alfama, the quarter of the seamen. Afternoon and evening at leisure. An optional excursion to Sintra and optional dinner with Fado-style entertainment are available. 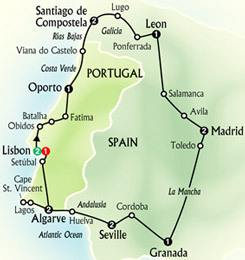 Day 4, LISBON to PORTO . Take a scenic detour into the vineyards and olive groves of the Serra do Aire hills. Step back in time as you pass through the main gate in the medieval perimeter wall of Obidos and stroll along narrow streets. Next visit the magnificent Dominican Bathalha Monastery, commemorating a 14th-century victory in Portugal's fight for independence from Castile. In nearby Fatima, join the pilgrims at the country's hallowed national shrine. In the afternoon, drive to the valley of the Douro River. At Vila Nova de Gaia on the southern bank, visit the prestigious Ferreira Port Wine Cellars. Hear how the country's premier export product is made and taste the strong, sweet wine. Overnight in Porto, on the northern bank of the river. Day 5, PORTO to SANTIAGO DE COMPOSTELA, SPAIN . Sightseeing in Porto includes a visit to the lavish 19th-century stock exchange, whose claim to fame is an Arabian Hall inspired by Granada's Alhambra. Then a change of scenery. Drive towards the northern border through an area where the rural population still lives off small patches of land tended with traditional farming methods. Enjoy a leisurely break in the Costa Verde resort and fishing port of Viana do Castelo before crossing the Rio Mino into Spain's wild northwestern province. The highway to Santiago de Compostela offers spectacular views of the Rias Bajas, the deep fjords of Galicia. Day 6, SANTIAGO DE COMPOSTELA. Santiago grew around the tomb of St. James, the Apostle who converted Spain to Christianity, and, according to legend, delivered the country from Moorish occupation. Today, visitors still pray at St. James'tomb in the huge 11th-century Romanesque Cathedral Vieja with its ornate Baroque facade. They also come for the unspoiled beauty of the Old Town centering on Plaza de la Quintana with the Holy Door and Plaza Obradoiro with its Hospital of the Catholic Monarchs. Afternoon free. Tonight your tour director will help you find typical Galician fare: lamb, cured ham, seafood, and cheese. Day 7, SANTIAGO DE COMPOSTELA to LEON. Look forward to two days of scenic eastbound travel along the ancient "Way of St.James." Morning break today is in Lugo. A perfectly preserved massive schist wall, dating back to Roman times, did not protect it from conquest by Moors, Norsemen, and Napoleon's revolutionary troops. Enter the province of Leon and head for Ponferrada, where Knights Templars gave shelter to medieval pilgrims. Their massive castle now lies in ruins, except for the superb main gate. Early afternoon arrival in Leon, the capital of Christian Spain at the start of the Reconquest. Guided sightseeing here focuses on the gothic cathedral. Daylight filters through no less than 12,917 square feet of stained glass windows. Also visit the museum with priceless works of art from two millennia and a complete 17th-century chemist's shop. Day 8, LEON to MADRID. Drive through the Tierra de Campos, Spain's rich granary. Midday arrival in the university town of Salamanca. Time for a stroll in its Baroque Plaza Mayor, one of the country's grandest squares. On the way to Madrid, take a break in walled and turreted Avila, where St. Theresa founded the Order of Carmelites. Day 9, MADRID. Morning sightseeing with a local guide takes you to the Royal Palace, Puerta del Sol, Plaza Espana with its monument to Cervantes, the Parliament, Cibeles Fountain, elegant Calle Alcala, and Paseo de Castellana. Then the highlight: a visit to the palatial Prado Museum with its extraordinary collection of masterpieces, including the best of Goya and Velazquez. Afternoon at leisure, with the possibility of joining an optional excursion to El Escorial and the Valley of the Fallen. Day 10, MADRID to TOLEDO and GRANADA . Situated on a hill surrounded by a loop of the Tagus River, Toledo attracts more sightseers from all over the world than any other Spanish town. See the Moorish bridge, an early synagogue, the 13th-century gothic cathedral, and the church of Santo Tome with one of El Greco's most famous paintings. There's time to visit one of the Damascene steel workshops before continuing your journey through the barren landscapes of Don Quixote's La Mancha. Cross the Guadalquivir River and head for the olive and orange groves of the rolling Andalusian hills. Overnight in history-steeped Granada. Day 11, GRANADA to CORDOBA and SEVILLE . Granada sightseeing focuses on its main attraction, the Alhambra. A fantasy of "lace in stone" surrounded by arabesque gardens and fountains, it affords superb views of the Old Quarter and Sacromonte, a mountain occupied by gypsy cave dwellers. Also amble through the exotic Water Gardens of the Generalife, the royal summer residence. In the afternoon drive through one of the loveliest areas of sunny Andalusia to Cordoba, with its 8th-century Mosque, famous for its 850 pillars of porphyry, marble, and jasper. On through the fertile valley of the Guadalquivir River to Seville. Day 12, SEVILLE Admire Maria Luisa Park. Drive to the Plaza de Espana, the Gold Tower on the Guadalquivir River, and the fine Baroque building which is now the university but used to be the tobacco factory of Carmen fame. Visit the cathedral with Columbus' tomb, the world's largest Gothic edifice and an undertaking considered sheer madness by its very planners. Finally stroll through the narrow lanes of the charming Santa Cruz quarter. The afternoon is free. Day 13, SEVILLE to the ALGARVE, PORTUGA L . Travel westward, past the port town of Huelva and across the Guadiana River, which divides Spain from Portugal. Now you are in the Algarve, Portugal's most popular holiday area. Afternoon at leisure at your beachfront hotel. Day 14, ALGARVE EXCURSION . Today you may prefer to relax, explore this beautiful resort at your own pace, or join the excursion along the enchanting southern coastline. History comes alive as you reach the wind-swept Promontory of Sagres, where Henry the Navigator lived and planned his overseas expansion. Only a few miles away is Cape St. Vincent, the southwestern corner of continental Europe, a dramatic cliff defying the waves of an ever-angry Atlantic Ocean. After a lunch break in pretty Lagos, return to your hotel with time left in the day to catch up on your postcards and shopping. Tonight is your chance to try one of the seafood restaurants for which the Algarve is famous. Your tour director knows the local scene. Day 15, ALGARVE to LISBON . Head north to Setubal, a major port and industrial center on the north bank of the Sado Estuary. From here take the scenic route over the Serra da Arrábida and savor sweeping views of the Troia Peninsula. Catch glimpses of the castle of Sesimbra, which recall fierce medieval battles between Christians and Moors. After crossing the Bridge of April 25th you're back in Lisbon for a last evening with the companions of an exciting touring adventure. Day 16, Your homebound flight arrives the same day.